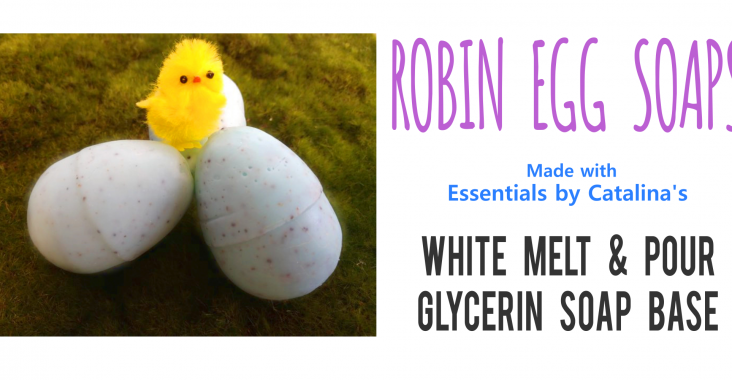 Robin Egg Soaps are a great product to have on hand during Spring. 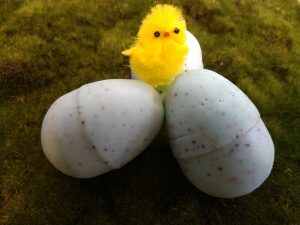 This tutorial shows you how to make these cute, blue speckled egg shaped soaps. They make great party favors and decor for themed bathrooms. An added benefit to these egg-cellent soaps, is that they have exfoliating poppy seeds and walnut shell powder to help gently scrub off dead skin, leaving it softer than ever! This is an intermediate tutorial because you have to pour the soap through a small opening while the soap is cooler. For beginners it may be difficult to tell when the soap will harden. There is no suspending agent in the soap, so the poppy seeds and walnut shell powder will sink to the bottom of the soap if poured too hot. For this tutorial you will need plastic eggs and tape. However if you have a 3-D egg mold on hand, then you won’t need the plastic molds. Or you can use half egg molds if you want an egg soap that has one flat side. All of these ingredients can be found on our website! Make a hole on top of the plastic egg (about 1/4 in. diameter). Then tape around the egg and any holes that may be on the bottom. You must tape it well enough to be confident no soap will leak out. Using your usual melting method, melt the White Soap Base until it is just barely melted. Then remove from the heat. Drop in the Soap Colorant at 2 Blue to 1 Green ratio. Add as much or as little as you need. Mix in a teaspoon of the Walnut Shell Powder and Poppy Seeds at a time until you get the speckled look you desire. Once the Soap is starting to cool and thicken pour it through the small hole at the top of the plastic eggs. Tap the filled eggs lightly so any bubbles have a chance to rise, then top the eggs off with more soap. Let the eggs cool completely before you take them out of the molds. If they are handled before they set, you risk having a lumpy egg. If the soap cools too quickly, then you can re melt the soap and continue to make eggs. 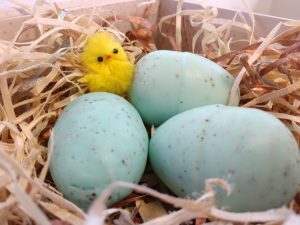 Different shades of blue make the robins egg soap look realistic and unique. Wrap these together in a labeled bag or individually. Make sure to label them as soap and are not edible.